The Council of Ministers has approved an agreement for the execution of the order for the construction of five F-110 frigates, for an estimated value of 4,317 million euros. 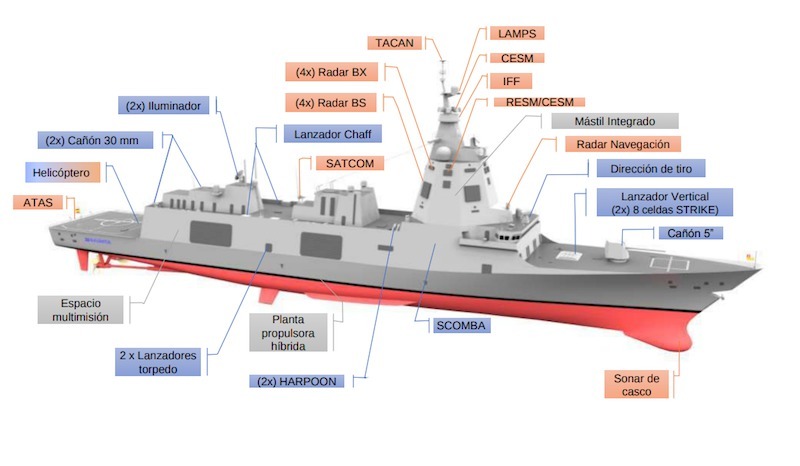 The object of the authorized execution order is the acquisition by the Ministry of Defense of five F-110 frigates built by the Navantia company. At present, the Navy has two types of frigates: five of the «Álvaro de Bazán» class (F-100) and six of the «Santa María» class (FFG or F-80). The FFG frigates entered service from 1986, and all of them are in their last third of life. In 2021, they begin to their 35th year of service, so to maintain their current capabilities it will be necessary to replace them with the F-110 frigates. The proposed program covers the need to replace the current F-80 frigates which are at the end of their operational life, so that the current capabilities of the Navy can be maintained and also cover future needs that could be derived from new operational scenarios, in which new threats and new missions are included. This acquisition is of great economic, industrial and social relevance for the entire national industry, given the complexity of the design, the integration of its advanced systems and the construction of the platforms themselves. Construction of five frigates, including the corresponding accoutrements (life jackets, interior safety equipment, mooring ropes, etc.) and first installation parts of each vessel needed to ensure safe navigation without external support. Obtaining Integrated Logistic Support for the F-110 class, which entails the logistic information of the ship, the obtaining of logistic documentation (Maintenance Plan, Procurement Plan and Training Plan, technical manuals, maintenance documentation, support documentation to provisioning), as well as the necessary systems for the implementation of the Digital Model and Twin. Industrial training, operation and maintenance for the personnel of the Ministry of Defense involved in the construction of ships and equipment. The authorized enforcement order comes from the current agreement between the Ministry of Defense and Navantia, and the payment schedule begins in 2019, ending in 2032. The delivery of the first unit is scheduled for the year 2026, and the last for the year 2031. The future F-110 frigates will be 145 meters/475.7 feet long, have a beam of 18 meters/59 feet, will displace 5,900 tonnes and have a crew of 145 people. Their unit cost is €740 million.